In 1824-25 the last surviving Major General of the American Continental Army toured all twenty-four American states as an official guest of Congress. Over a quarter of the American population came out to honor the soldier during his farewell tour, including residents in Darien. On March 7th at 3:30 p.m. the Darien Historical Society will host a lecture by Alan Hoffman, translator of Lafayette in America in 1824 and 1825, a book that offers a rare glimpse into America during the early nineteenth century and extols the virtues of the French hero. Hoffman is an affable and erudite man who holds degrees from Yale and Harvard and practices law in Boston. He is not an academic but has always been fascinated by the American Revolutionary period and became interested in Lafayette when reading of the fervor created by Lafayette’s farewell tour. To satisfy his own curiosity, Hoffman started reading the original French account of the tour by Lafayette’s friend and private secretary, Auguste Levasseur. Despite not having studied French since high school, Hoffman found he could read the 1100-page manuscript without too much help from his French-speaking wife. He began translating the pages on evenings and weekends as a hobby. However, as his knowledge Lafayette’s contributions to American history and his stacks of handwritten notes grew, Hoffman decided that he had something worth publishing. Three years later, Hoffman’s masterful translation was published, and he began his own tour to promote his book and place Lafayette in the pantheon of American heroes. Lafayette was born into aristocracy and a life of privilege in France in 1757. He was, however, in favor of the rights of the common man and against tyranny in all forms. At the age of nineteen he gained passage to America and joined in its struggle for independence from British colonial rule. General Washington took the young French soldier under his wing, promoting him to the rank of Major General. The French Major General proved himself invaluable during the American Revolution. He not only persuaded the French government to send additional troops and naval forces to support the American cause but also commanded his troops superbly in battle. At Yorktown, Virginia, Lafayette contained Lord Cornwallis’ British troops, despite being severely outnumbered. In addition, Lafayette led a successful assault on a redoubt above the city that virtually guaranteed American victory. With victory on the redoubts, the American Revolutionary War was over, and General Washington declared his young French, protégé the hero of Yorktown. After the war, Lafayette returned to France to take part in its own social and political revolution and become an apostle of liberty in Europe. Just as in America, he supported the rights of the common man and was staunchly against slavery. He remained close with President Washington and even named his child after the first American president. Almost fifty years later, during a time of optimism and prosperity, Lafayette was invited to return to America to be saluted for his efforts on a farewell tour. He brought his private secretary, Auguste Levasseur, to assist him and document the event for posterity. Hoffman’s book shows that Lafayette’s popularity during his farewell tour was staggering. The excitement his tour created was like nothing ever seen, before or since, in this country. The biggest touring spectacle of 2009 was U2’s 360-degree tour, attracting 1.3 million fans. The aging Marquis of Lafayette drew three million spectators in thirteen months, over one-quarter of the entire American population. Hoffman argues that Lafayette’s is perhaps the most popular touring event in American history. 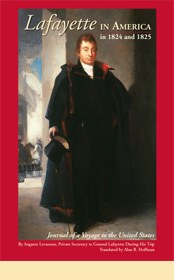 Apart from his contribution to the American Revolution, Lafayette’s greatness lies in the context of his interactions with American politicians and the American public during the tour. He could have used the platform to publicize his progressive views and perhaps divide a country struggling to decide what to do about slavery and the rights of African-Americans and Native Americans. Instead, despite being staunchly abolitionist, Lafayette used his charisma and compassion to guide America’s social progress. Hoffman cites examples from his book where Lafayette stunned spectators by publicly embracing and drinking champagne toasts with African Americans in both Georgia and South Carolina. Hoffman has received acclaim for his book, and his tour has been well attended. However, no matter how successful Hoffman is, he understands he will never match the popularity of his subject, the French hero of the American Revolution, and apostle of liberty for all mankind, the Marquis of Lafayette. On March 7th Hoffman will combine information from Lafayette in America in 1824 and 1825 with periodical accounts of tour events in our area to describe the historical significance of the Marquis of Lafayette. The presentation will include a slide show and question-and-answer period and take place in the Historical Society’s Scofield Barn at 3:30 p.m. Admission is free, but space is limited. Reservations are recommended and can be made by contacting the Darien Historical Society at (203) 655 9233,or email info@darienhistorical.org.